Many of you are well-acquainted with the Italian gentleman whose handsome head pops up on many pages around this neighborhood. Always nattily dressed in dark suit and narrow tie, always raising his glass and leaving kind words to cheer us. He’s known to us as Chicago John. And he’s a legend in these parts. Only a handful of times in my life have I made pasta from scratch. I should be throttled for that! The man I married (who calls himself my grateful guinea pig and is such a good sport) is an enormous fan of pasta. Wrong word choice…he likes pasta, a Lot. 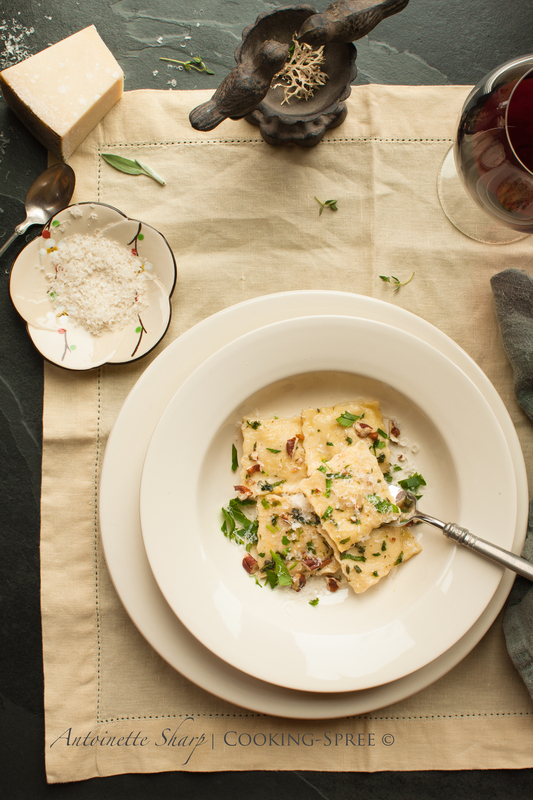 So it was that when I spotted John’s series of posts on pasta – and then – Ravioli! – I knew I’d just discovered the Holy Grail – no question about it – this was D.i.n.n.e.r. – written in the Guinea Pig’s own Language of Love. Prepare the filling: Preheat the oven to 375°F (190°C) Slice the squash in two, from top to bottom and scoop out the seeds. Brush the cut surface with vegetable oil and place cut-side down on a baking sheet lined with parchment paper or silpat. Bake until soft – about 40 minutes (though begin checking at 30.) Scoop out the flesh and measure 2 cups full. Drop it into a food processor (or mash well with a fork) blending with 2 Tablespoons butter. Season with a dash of cayenne, grated nutmeg, salt and pepper. Season to your own tastes. (It will not need to be fully seasoned with salt since the cheese will bring some of its own.) If the squash seems a bit too liquid-y you can dry it out by dropping it into a skillet on high heat for a few moment. Add bread crumbs and cheese. Set aside. Prepare your pasta sheets. 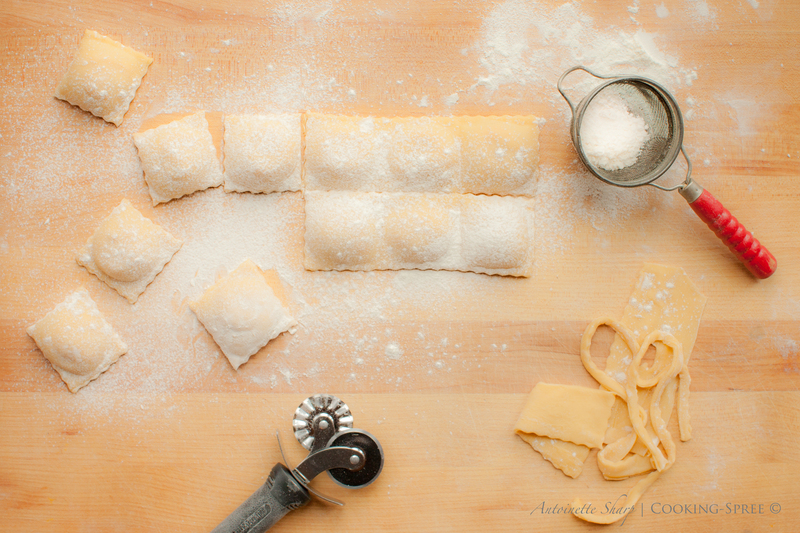 You can use a pasta “die” – see John’s site for a variety. (I used a 2 inch, 2-part die for these.) 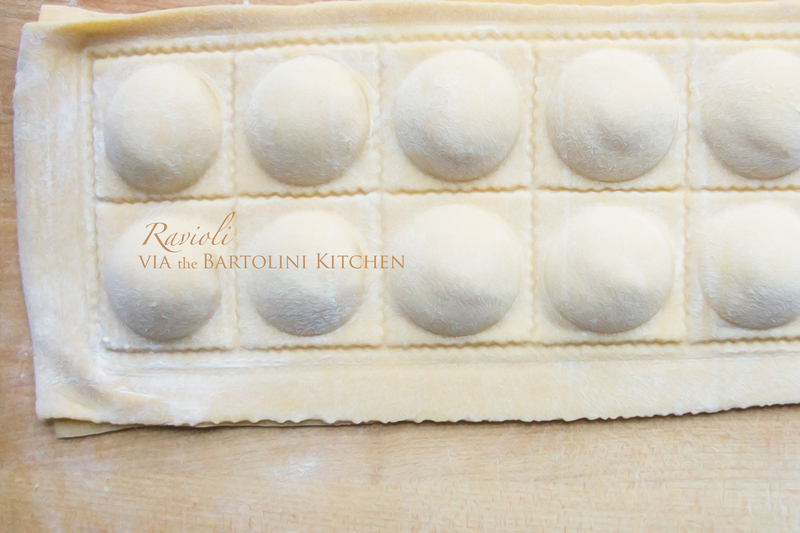 If you prefer, you can use a round biscuit cutter to form your ravioli. Simply fill lightly, brush water around the perimeter, fold in half and crimp the edges. By drawing up the points you can form a slight crescent. NOTE on filling the ravioli: Here’s where I was more paranoid than necessary. I was afraid of over-filling the ravioli. They could have used a bit more filling and next time I’ll know. But what we really really don’t want is for all our lovely stuffing to drift out of the ravioli into the water. They will swell a bit during cooking. In a skillet large enough to accommodate the ravioli, melt the butter. Add the slivers of garlic, the sage, 1 Tablespoon of the parsley, and the thyme. Cook over medium heat until the butter is slightly browned and gives off a nutty aroma. Cook the ravioli in salted gently boiling water for 4 to 5 minutes. Drain. Add the pecans to the skillet with the remaining parsley and then slide the raviolis in, single file. Cook for half a minute, then sprinkle (liberally) with parmesan or pecorino Romano. 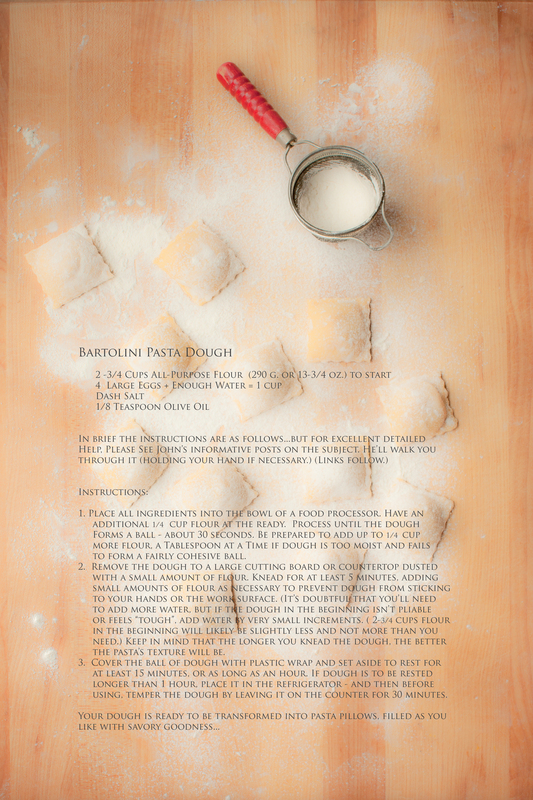 For a printed version of both recipes, click here. Congratulations! I knew you could do it, Spree, and just look at how well you did! Very impressive. You should be very proud of this dinner. 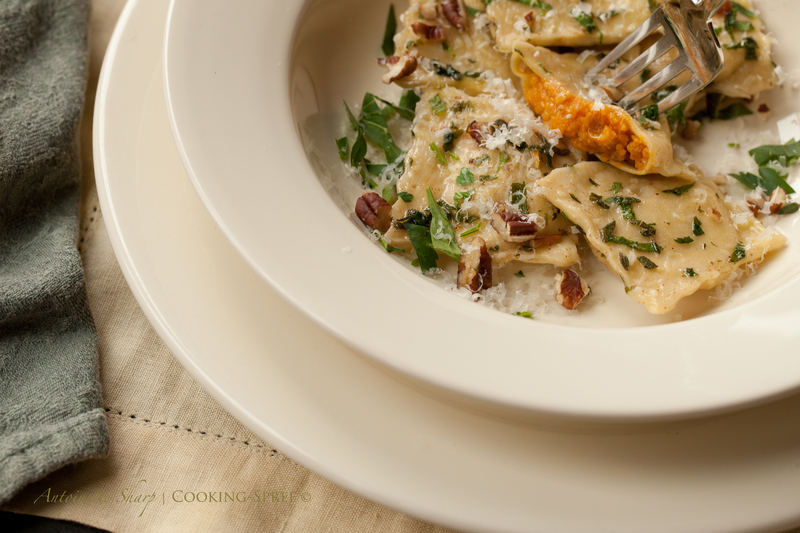 Not only are the ravioli flawless but your filling of butternut squash is paired perfectly with that brown butter sauce. I’m sure had one happy GP seated at that dinner table. It’s hard not to be when fresh ravioli are being served to you. Thank you so much, Spree, for your kind words. It is you, though, that deserves all of the credit. All I did was show you some of the mechanics. 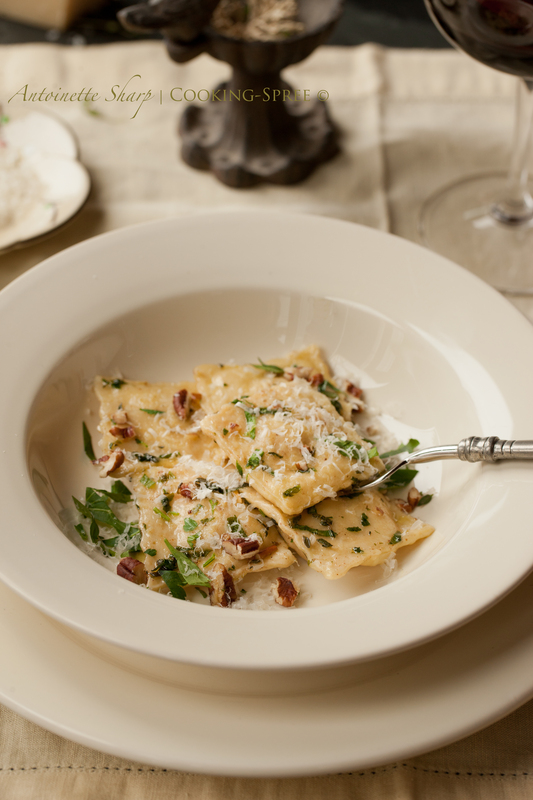 These ravioli, with their incredible filling and sauce, are all your doing. And you don’t see yourself a pasta maker? Ha! Now I cannot wait to see what’s next. You were such an encourager through this process John! It wasn’t the “pasta” per se that had me a bit freaky – 😉 – but the whole thing about layering two together, filling with something delicious and not having it all fall apart, or fall so far short of expectations after a not so insignificant amount of work. This was a lesson for me (in more ways than one!) If we all just approached food with a bit more playfulness, there’d be more light and laughter in our homes! Thank you John so much for mentoring me through this…I would NOT have tried it if it weren’t for you! So Spree…. I am enormous huh? Cmon, pudgy – sure. Enormous? Only if I keep eating Chicago Johns ravioli. They were mighty good. Loved the pecan crumbles and sage garlic butter. Num. Gorgeous! Now you can start wandering through the colored and flavored variations in Madison’s book–we like the bright green pasta made with fresh spinach! Looks and sounds beyond fabulous! Your gorgeous use of John’s spectacular pasta: a match made in culinary heaven. Congratulations! Thank you Kathryn Wish I could have served you a plate of it! Yes, please! These look amazing, and your photography — the treatments, the staging, the how-do-you-do-it…incredible. I love the inspiration of Chicago John — and from all I see and hear, his positive demeanor and spirited encouragement do most certainly help impart courage — and then you took it and ran with it and look and sound to have made a mighty tasty meal for you and the GGP. Congrats! Thank you Roger, and honestly, I can’t say I blame you. Though (for mechanical reasons and twinges of nervousness) this wasn’t “entirely” fun, I think next time will be. These just look wonderful – gorgeous shots too – your posts are always such a breath of comfort and lightness, I love coming here..
That is such a compliment to me! Thank you so very much! Reblogged this on Curious Eaters. This looks absolutely delicious! Your layout and photography are simply stunning as well. I can’t wait to try – and to send to my mother who is an avid lover of all things butternut squash. Such a kind compliment! Thank you very much! (Happy you stopped in!) We too are lovers of just about all things butternut and this left us smacking our lips & contentedly sighing. Hope your mum likes it! Good on you to manage this. My hat is off. Thanks so much for this Viveka! 🙂 Such kind words you leave me! You’re a very passionate cook. Wonderful to see. OH yes, oh yes – that looks wonderful! What a cracking recipe – the colour has remained so vibrant. I like. 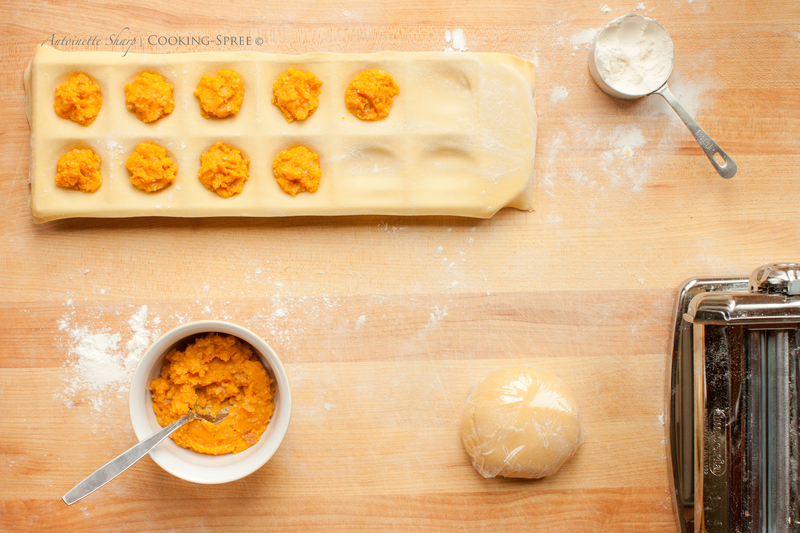 IT’s funny – I was saying to Katherine earlier how much I wanted to make some stuffed pasta this weekend! Aaah the Bartolini fan club !!! One day I will get round to making my own pasta and it will be John’s recipes I head for – plain and simple. What I’ll miss in the making is is wit and humour! I felt John’s wit and humor alongside me as i stuffed me pockets with squash, but the real thing would have been much preferred! Wonderful photos. And Chicago John must be so proud! I was so inspired by your photography that I rushed right out and purchased all the ingredients for butternut squash triangoli, although–full disclosure–in this case the ingredients had already been assembled by workers in Italy and then jetted into the refrigerated section at Trader Joe’s. Now, I’m sure they were not nearly as delicious as yours but they were the most convenient substitute I could find, given that as a senior citizen, I’m just too intimidated by the idea of learning how to make ravioli from scratch. Spree, go directly to your nearest beautiful foodie magazine and ask for a job. Your photography and styling for this post is GORGEOUS! Makes me want to go and cook and take pictures right away. Would you consider an Australian apprentice?? Utterly utterly soul food photographed with warmth and tenderness. Love the warm colour balance here suits it well. This is quite a layout. Magazine quality. I know I’ve said that before and hate to over-use it but it’s true. The recipe looks like a tear-sheet. I’m not afraid to make pasta itself but funny enough for me it’s been the butternut squash filling. But this looks so light and well, delicious. Just. Beautiful. Wendy – wow. I appreciate your compliment so very much! (If you’re “over-using” the compliment, I hadn’t noticed, and if I had, I wouldn’t mind! 🙂 ) I wasn’t afraid of “pasta” per se either. A little nervous I guess when it comes to sharing my results with the world outside our own dining table. And (is this ridiculous?) I did kind of want John to know how well he’d taught me because he does such a stellar job! I was worried about the ravioli! Putting two sheets of pasta together, having them Stay together and not spill their lovely guts into the pot. The squash? Oh love, it’s so easy! And so good, honestly, do this! 🙂 Thank you again Wendy so much for such lovely words! Chicago John is my mentor for Italian cooking also, Spree. I read his post about ravioli and you’ve certainly done him justice. Your finished dish looks absolutely delicious, and when I saw that photo of the plump little raviolis I just wanted to pat them. They look adorable! John’s our go-to guy isn’t he Mar? On anything Italian (especially anything pasta) I’d go no where else! (Hoping not to offend anyone by that remark! 🙂 ) I love your comment about the plump raviolis – don’t they just look like they Want to be patted? Thanks again so much for your really kind compliment! For some reason my PC wouldn’t let me respond by “commenting” but I just want to say I love this! You write so well to make “food” feel like a “warm hearth and home”! You nourish those you love with such wonderful, healthy food with Heart Love through Hands. Blessings be yours and one day I will try this. Hubby’s the guinea pig, ey? I’ve got one, too. Most baked goods must exit the premises b/c he can’t resist them. Your pasta looks gorgeous. Maybe I’ll give it a go myself. Thanks!